Lots of sources have been reporting that Ringo Starr is being inducted into the Rock Hall Of Fame Saturday (4/18). While the Beatle drummer will command a good deal of attention during the ceremony in Cleveland, his entry into the Hall is a backdoor one. 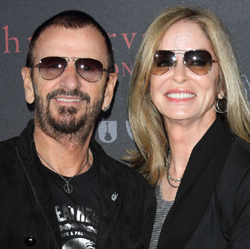 Ringo was not on the ballot and will be 'introduced' as a Lifetime Achievement winner, not as a full fledged member. Some say the fact he's being honored at all is only due to Paul McCartney's insistance.